Happy Thanksgiving! I hope you enjoy this freebie from Smartkinderkids! With this freebie, you get a brightly colorful and happy smartboard puzzle. 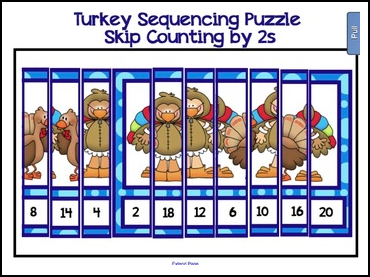 Students can work whole group, small group, or individually to sequence the puzzle from 2-20 (skip counting by 2s). 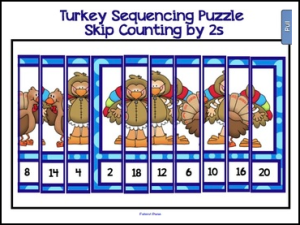 This freebie can also be used as an Assessment Tool by teachers to determine if students can count by 2s. If you like this product, please consider leaving positive feedback in my TpT store and checking out more Smartboard products! I love Smartboard files because I ensure that my students are actively engaged in their learning, are developing fine motor skills as well as technology skills. The biggest plus as a teacher, besides knowing your kids are learning and having fun, is that you don’t have to search for space to store the items as in traditional center games – just save to a thumb drive and VOILA – you are set for next fall. I hope you enjoy!